6 + 1 = ? : (Required) Please type in the correct answer to the math question. We got away early and decided to visit National RV Central beside I-10 to try out their automated RV wash. It can handle up to 65 ft units and washes the top, bottom and all four sides. It did an amazing job. The wheel covers have never looked so good. The manager said he wanted to test something so we got the $95 wash for $35. He told me that 80% of the water is recycled and they only do RVs. There was a repair facility at the same location, so I decided to get them to look at the problem we are having with the power steps that have a safety feature that makes the steps retract if the engine is running and the doors are closed. The problem is the steps were not retracting. I got a real education from the mechanic, Denny, on trouble shooting this kind of problem. After $196 the problem turned out to be a faulty cable assembly. He bypassed the cable and everything is working again. I'll replace the assembly when I can get a new part. The assembly is supposed to protect the step computer if there is a voltage spike. We finally left Tucson at 1:00PM and got to Yuma at 6:00PM. We are in Riverfront Park, which must be one of the oldest RV Parks in Yuma. 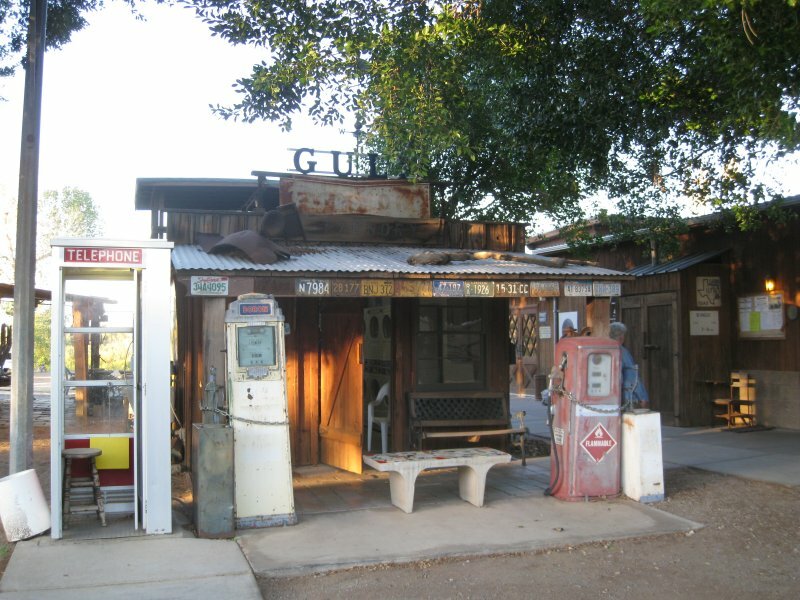 It is decorated with old cars and gas station stuff (see photo of the laundry). There are a total of 170 RV parks in Yuma covering vast areas and occupied by retirees. These folks know where to go as this is the warmest place yet at 78 degrees.